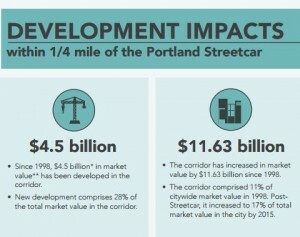 Since its construction in 1998, the Portland Streetcar has led to $4.5 billion worth of real estate development, according to a recent study by ECO Northwest. Market values have been pushed up by more than $11 billion in almost 20 years of the rail service, which runs from the Southwest Waterfront neighborhood through Downtown and the Pearl District. The study is likely going to influence future rail construction around the city. More than 18,000 new residential units exist within one-quarter mile of the Streetcar, and 41 percent of those homes are attributable to the rail, along with 35 percent of the new commercial real estate near the rail.